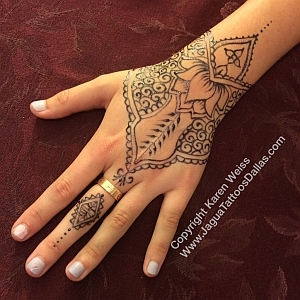 Individual henna appointments are available at our North Dallas location near I75 and I635. Prices start at $20.00 and the cost depends on the design desired. You are welcome to bring in or email a design or choose from the many we have. We travel to you to make your event special! Let our highly professional team of artists delight your guests with beautiful, natural body art.